Three Republicans and two Democrats are vying to replace Sen. Jeff Flake, who announced last year he would not seek re-election. Family I have three brothers and two sisters. Education BSW in Social Work from BYU; Masters in Social Work, law degree, Ph.D. in Justice Studies, and MBA from ASU. Work history Social worker, attorney, Arizona state representative and senator, congresswoman. I know firsthand the challenges everyday Arizonans face. I was born in Tucson and went through some tough times growing up. For a while, my family was homeless. We got by thanks to family, my parents’ church, and hard work. My childhood experience showed me the power of working hard and the importance of helping others. Those are the values I’ve taken to Congress where, even amidst the chaos of Washington, I’ve been able to get a lot done for Arizona. We passed the largest pay raise for our military in a decade while blocking a pay raise for members of Congress. We’ve supported our veterans, defended health care access, and protected Medicare and Social Security. Sen. McCain and I successfully worked to protect $3.5 billion for Arizona schools. I’ve been ranked the third most independent member of Congress because I’m committed to working across the aisle to get things done. Arizona deserves a Senator who will be a voice for every Arizonan, and I’d be honored to have your vote. 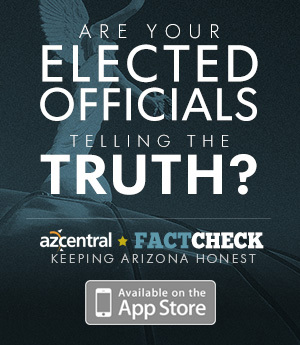 I’ve always said I’ll work with the President when he’s doing right by Arizona and hold him accountable when he’s not. The dysfunction in Washington isn’t new, but it continues to get worse. We need leaders who deliver results for Arizona families and defend the values we share as Americans. One area where I have worked well with President Trump is on improving care for our veterans. He has signed 5 laws I worked on to improve access to health care and educational opportunities. I’m also proud of my bipartisan law the President signed recently that cracks down on financial crimes targeting seniors. I have taken action when President Trump has done wrong by Arizona, such as when he started a trade war that is essentially a tax on everyday Arizonans. I pushed back against dangerous attempts to make health care more expensive and harder to access. I stood up to the President when he supported Vladimir Putin’s false claims of innocence regarding Russia interfering with our democracy. Securing the border is a matter of keeping Arizona families safe. We want real solutions to fix the broken immigration system, not just more partisan talk. It’s possible to secure our border, keep families together, protect Dreamers, and fix our broken immigration system. If political leaders in Washington won't step up to fix the problem, it's time for them to step aside. I’m part of a group of Republicans and Democrats who have introduced a bill called the USA Act. Our bill invests in smart border security and provides a path to citizenship for our Dreamers. The USA Act makes investments in smart technology, like drones, cameras, and towers, and enhances manpower on the border. This combination of resources will help us secure the border and stop the dangerous cartels that are bringing in drugs and engaging in human trafficking. Our national debt is spiraling out of control and, if left unchecked, will have significant implications for our nation’s future. That’s why I have consistently opposed partisan budgets that threaten the economic security of hardworking Arizonans. I’ve also co-sponsored plans to cut at least $57 billion in unnecessary spending over ten years and eliminate duplicative and wasteful federal programs. For these and other efforts, I’m proud to have been recognized with the Fiscal Hero Award, which is given to leaders who work across the aisle to tackle our national debt. In Arizona, we know that fiscally responsible budgeting will make us more competitive and strengthen the long-term financial security of our families. Arizonans know that I’ve always been willing to stand up to the political parties and put Arizona first. Every day, I hear from Arizonans that the leadership in both parties has let us down, and we all agree it's time for a new direction. Everyone in Arizona knows: I'll work with anyone to get things done for Arizona. This race is about getting beyond the Washington chaos and dysfunction and working together to deliver results for Arizona families. I voted against Nancy Pelosi for Speaker, and I will not support Chuck Schumer in the Senate. I was ranked the third most independent member of Congress because I stand up to political parties and always put Arizona first. That’s what I will continue to do in the Senate. All Arizonans deserve access to quality, affordable health care, yet it remains out of reach for too many families. Growing up, there were times my family went without health insurance. No child should ever go without a doctor, and no family should have to choose between getting health care and paying the bills. Our health care system is broken. We must work together to fix our system, not go back to a time when Arizonans had no control over our health care. I have worked across the aisle to make important fixes. We extended protections to small businesses, saving business owners and employees money. We also delayed the Health Insurance Tax, protecting everyday Arizonans from a premium increase. Now, we need to focus on common-sense solutions that both parties support: Repealing the health insurance tax for good, relieving pressure on small businesses, and guaranteeing cost sharing reductions to deliver more affordable care. I’ll keep working to get them done. The scientific consensus is that human activity contributes to rising temperatures and action is needed to reduce emissions. I believe efforts to address climate change must be based on the best available science. That’s why I support thoughtful and reasonable approaches to reduce climate pollution while ensuring Arizona families and businesses have affordable, reliable energy to power our economy into the future. I’ve championed solar energy development in Arizona and have supported commonsense policies like the renewable tax credit, energy efficiency incentives, and state-level renewable portfolios that reduce emissions and provide a smooth transition to cleaner sources of energy. Russia is an authoritarian regime that remains one of our greatest geopolitical foes. I stand with our men and women in the US intelligence community who confirm that Russia attacked our democracy and continues to undermine the security of the United States and our allies. We must work together—Republicans, Democrats and Independents—to stand against this aggression. I support the special counsel’s independent investigation and am working across the aisle to ensure that Special Counsel Mueller’s work proceeds without political interference. The special counsel’s investigation is critical for our democracy, and Arizonans need assurance that our elections are free from foreign influence. I will work together with my colleagues to put country over party and make sure the investigation is completed. Nearly every Arizonan knows the “five C’s” of our state: Copper, Cattle, Cotton, Citrus, and Climate. They are part of Arizona’s identity and fuel our economy. Unfortunately the administration’s decision to impose tariffs is hurting Arizona, because our economy—from copper to citrus to high tech manufacturers—depends heavily on trade. We’re already seeing our trading partners like Canada and Mexico impose tariffs on things made in the USA. These broad tariffs could lead to a trade war where no one wins. That’s why I introduced a bill with Republican Rep. Mike Gallagher implementing Congressional oversight for tariffs like those recently imposed by the White House. Our bill allows Congress to review tariffs proposals and reject those that don’t work for Arizona. Our trade policies should help everyday Arizonans get ahead. I’ll keep fighting for the communities across Arizona who depend on sensible trade policies for their livelihoods. Like many Arizonans, I grew up around firearms. I support the Second Amendment and believe it protects individuals’ right to bear arms. I also worked in Arizona schools for over a decade. It was my job to recognize and treat kids who needed help, and I've seen first-hand how the system comes up short. No family should worry about sending their kids to school. No student should fear going to class. We must do better. I stand with the vast majority of gun owners who support requiring background checks, closing the gun show loophole, and fixing the federal system. We must ensure our classrooms are safe and secure, study the root causes of gun violence, and expand mental health training for first responders and educators. We need more mental health professionals in our communities so we can identify and treat people before they hurt themselves or others. We can solve these problems right now by coming together around common sense solutions. For Arizona to thrive, we know we must build an economy that works for everyone. I’ve worked across the aisle to help create good-paying jobs, cut red tape for small businesses, and grow Arizona’s economy. That's why I was endorsed by the Chandler Chamber of Commerce and have received the U.S. Chamber of Commerce’s Spirit of Enterprise award every year I have served in Congress. I am fighting to increase access to affordable education and career and technical training. We passed a law that expands educational opportunities for veterans, and I worked across the aisle with Senator McCain to protect $3.5 billion in education funding for Arizona schools. I am committed to closing the gender pay gap because making sure every Arizonan gets equal pay for equal work is critical to Arizona families and our state’s economic success. I will work with anyone to increase opportunity for everyday Arizonans. Trade plans must help everyday Arizonans get ahead. Mexico is our largest trading partner, and Canada is our second largest. Trade escalations between these countries that result from poorly renegotiated NAFTA contracts could hurt Arizona’s economy. A trade war between Mexico, Canada, and Arizona is dangerous for our state. The tariffs make products more expensive and limit the ability of our farmers, manufacturers, and other small businesses to export their goods. That’s why I’m working with Republicans and Democrats to ensure trade policies work for Arizona families. I will continue to work across the aisle to enact fair trade deals that strengthen our economy, grow our small businesses, and protect our workers. I’ve always been willing to stand up to the political parties and put Arizona first. I am proud that — even in a chaotic and dysfunctional Washington — we’ve improved care for our veterans, defended access to health care, and cut red tape for small businesses, helping grow jobs right here in our state. Arizonans know I’m independent and am not afraid to stand up to party leaders, like when I voted against Nancy Pelosi for speaker. Just recently I broke with most members of my party when I voted for the Right to Try Act, a critically important measure that allows Arizonans battling life-threatening conditions to attempt every possible life-saving treatment. I was proud to vote for this solution that could save lives in our state. In Arizona, we value hard work, love of country, and respect for our neighbors. Like so many Arizonans, I learned these lessons from my family, my community, and my parents’ church. I carry these values with me today as I seek out common ground with people to get things done. I’m not afraid to stand alone to do what’s right. I tell the truth, even when it isn’t easy, and Arizonans know they can trust me to make decisions based on what’s best for our state and not by any other calculation. Too often in Washington, petty politics makes people run to their corners and forget about our shared love of country. That’s what’s wrong with Washington, and that’s why it’s my job to bring our Arizona values to the U.S. Senate. The example set by Justice Sandra Day O’Connor has always inspired me. Justice O’Connor is a woman of great integrity and represents the best of our Arizona values. Justice O’Connor—the daughter of a rancher—became the first woman to sit on the Supreme Court because of her grit and common sense approach to solving problems. Justice O’Connor is an Arizonan through-and-through, and her work is a reminder to all of us to live life with confidence in our values, an unwavering independence, and a sense of humor.